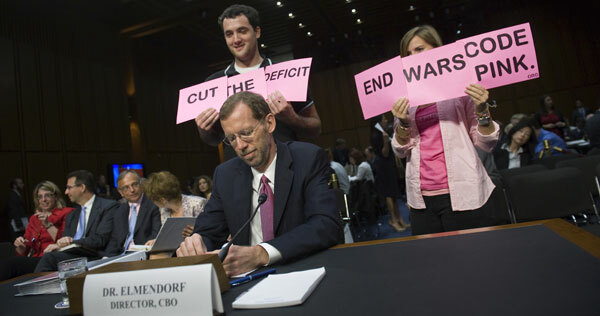 CBO to Super-Committee: Increase the Deficit! The head of the non-partisan Congressional Budget Office had some intriguing advice for the “super-committee” on deficit reduction. The head of the non-partisan Congressional Budget Office testified before the super-committee on deficit reduction on Tuesday, and while he outlined the basic math behind the nation’s long-term debt problem, he had a surprising message: don’t be afraid to make the deficit bigger over the next couple years, while the nation battles recession. Douglas Elmendorf, the CBO director, said that given the massive Bush tax cuts, which severely throttled the federal government’s revenue stream, and given the large number of baby-boomers who will be on Medicare—combined with skyrocketing health costs—something has to give. “Citizens will either have to pay more for their government, accept less in government services and benefits, or both,” he said. He then urged the committee to make sure that whatever they do, it doesn’t actually have a real effect any time soon. “Immediate spending cuts or tax increases would represent an added drag on the weak economic expansion,” he said. This, of course, roughly mirrors what Obama proposed in his American Jobs Act—an increase in spending in areas like infrastructure and aid to state governments, along with reductions in payroll taxes. It’s possible that the super-committee could actually enact certain parts of that plan in their final report. But many of the committee’s austerity-obsessed Republicans weren’t hearing it. Representative Jeb Hensarling, a co-chair of the committee, said that slashing spending and reducing the deficit was in itself stimulative. Similarly, Sen. Rob Portman tried to get Elmendorf to agree that European countries that embrace austerity budgeting perform better and recover faster than those that don’t. Elmendorf refused, and cited a recent International Monetary Fund study that found austerity increases unemployment while also lowering wages. The committee’s liberals, meanwhile, repeatedly stressed that the policies over the past ten years that created the current deficit shouldn’t be part of whatever solution the super-committee comes up with. “We embarked upon two wars, one of which was dubious at best. Using credit cards, we instituted two tax cuts, totaling $544 billion, which were tilted in favor of millionaires and billionaires,” said Representative James Clyburn. However the super-committee decides to act, time is short. The deadline for the super-committee to report a plan is November 23, but Elmendorf shaved three weeks off that deadline on Tuesday when he told the committee that the CBO will need a plan in the first week of November in order to score it by the deadline—something both parties will certainly want.